Unless milling about and smoking is part of their job description, some Russian laborers have perfected the art of taking breaks. I passed one such troupe recently; a half-dozen road workers honing their resting skills with pensive draws on inexpensive cigarettes while squatting in the shade and staring indifferently at the occasional car or truck that passed. This was the Ternei County roads crew, and they were out fixing potholes. I was one of four people in a pickup truck headed north to the village of Ternei, with tiger biologist Dale Miquelle behind the wheel, and this section of road was a patchwork of unpredictably-located and sometimes unavoidable pits. These ruts were waiting to be filled with shovelfuls of hot asphalt and pressed flat by a steamroller, but in the interim they were being filled instead by inattentive drivers who plowed their vehicles into the depths of these yawning chasms. We rounded a bend to pass an idle steamroller manned by a bored-looking gentleman; he leaned on the steering wheel and looked back towards the curve where perhaps he expected the roads crew to appear at any moment. He had not received the same lollygagging memo they had. Up ahead, just before the low pass where the road turns back to gravel, a delivery truck loomed. Dale, interested in passing the larger vehicle, moved in close. The obscuring wall of truck suddenly jerked to the left to reveal a single tire rolling unwavering toward us at a rapid pace. Dale swerved to avoid it; this road meteor that shot past. 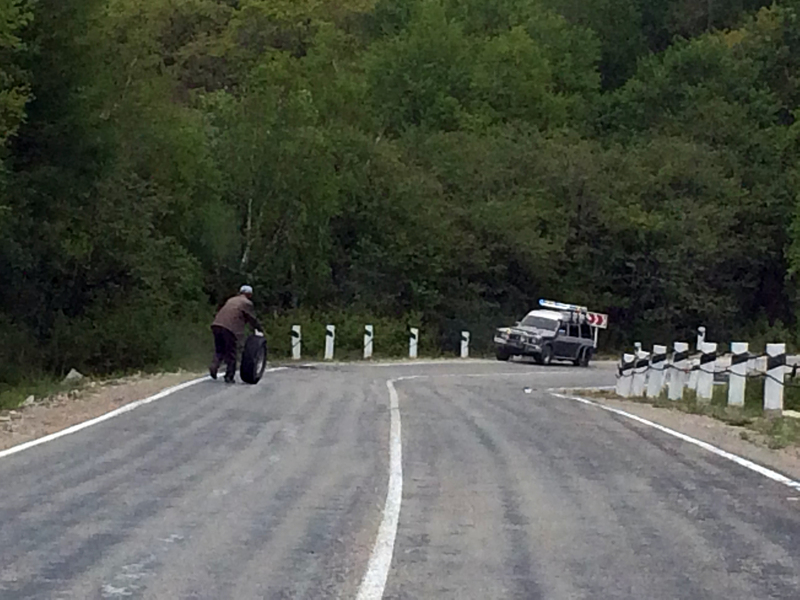 Far ahead—about a hundred and fifty meters—we could see a lopsided grey and white SUV that would be level if it had all four wheels intact, and an understandably confused-looking man shuffling down the road after the tire. His arm was outstretched as though willing the spinning rubber to come to its senses and abandon this crazy wanderlust. We stopped when we reached the fellow and offered to help him retrieve his tire. With all the excitement, however, no one had actually tracked where it had gone. This was without question an unlucky stretch of road to lose something as important as a tire—downhill and relatively straight—with dense brush on one side and a precipitous drop to the Sea of Japan on the other. If the tire had veered left towards the sea it was certainly gone forever—destined for a future life as an artificial reef—so we focused our search in the foliage on the other side. We circled back to where we had seen the steamroller eager to flatten malleable blacktop, hoping its driver might have noticed the wayward tire, but when we approached its driver was missing. Dale looked downslope into the thin forest and solved the mystery: the man was hunched in a poop pose and unwelcoming of our scrutiny. By the time we finished our fruitless reconnaissance of the roadside shrubbery and looped back north, we rounded a bend and saw the tire-seeker up ahead, dutifully rolling his prize back to his truck. He had found it. We wished him luck and continued on our way to Ternei. That night, Dale animatedly recounted this experience at a dinner with a half-dozen friends. Everyone expressed the proper reactions at the appropriate times, but what surprised me most was the conversation that followed, where nearly everyone present recounted their own stories of tires flying off vehicles and the hilarious chaos that ensued. I, quite honestly, was unaware that this was such a pervasive problem. But let’s all use this time to make sure our lug nuts are tightened satisfactorily. You might remember cousin Maryanne … her mother used to tell a story about driving down US 1 and seeing a tire roll past their car. “Look at that,” she said. “Some poor fool lost the tire off their car!” About that time, their own car ground to a halt, metal on concrete. Yeah. It was their tire.